This blog contains reviews and comments on children's books which I own, have read, and would like to share. I look for books at markets and opportunity shops. They are cleaned up, covered and read. Then I take them to the classroom for students to read. Students can borrow the books at any time. Many books are also from my personal library, especially the Youth Fiction. Students can preview some of them on this blog. Now, I am also on the lookout for great new releases for my grandson Archie. This hard hitting book is aimed at the middle high school age group and carries a poignant message about helplessness and suicide. Fourteen year old Jed is obsessed with Kurt Cobain and Pearl Jam and feels he has nothing to offer anyone. It doesn't help that his parents are too wrapped up in their own marital issues to notice or spend any time with their very anxious and emotionally fragile son. He can't understand how they ever got together in the first place, such is the constant discord in the family. His younger, eleven year old sister, India, is the exact opposite, outgoing funny and able to water down or dismiss the caustic arguments her parents have by singing songs out loud which encapsulate the topic of the argument. For example, if her parents are embroiled in an argument about mail, India sings Return to Sender, or if her father is feeling bleak, she will spout off Don't Cry Daddy or Such a Night. She coins her brother's name, Shoovy Jed, and devotes a great deal of time in trying to lighten him up. 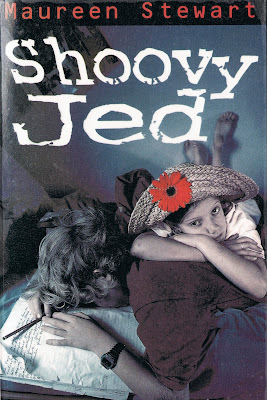 Jed loves and appreciates India, and also desperately to make a connection and to confide in Skye, a young girl who is equally troubled. He also attends sessions with a couple of his teachers, but it is just proves to be too difficult. So the book grinds its way onto its inevitable and shocking conclusion. But it is certainly not the end you are expecting. Time for a wake up call.